Julián and Joaquín Azulay (Gauchos del Mar) are two argentinean brothers that made a trip through the American Continent on a truck starting from Los Angeles, CA and finishing in Buenos Aires, Argentina surfing the American Pacific coastline. Their dream of surfing America lasted 403 days, where they drove more tan 30,000 kms across 13 countries. They show the Continent as a whole, through its different cultures, towns, villages, food, people, animals, landscapes while camping and surfing perfect and remote waves on their way back home. Their dad was one of the first surfers in Argentina in 1963, so as to put the audience in context they introduce their journey as a legacy their father gave them by showing 8mm and 16mm footage on how surfing started in Argentina. 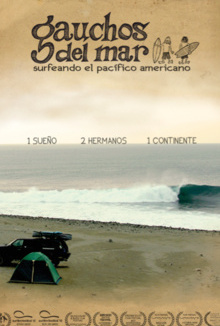 The film has a strong social, cultural and surfing content where they transmit messages of simpleness, freedom, passion, brotherhood, environmental awareness and social responsability apart from showing that life in the city is an option, but not the only one. Sometimes dreams are not as easy as they seem. These two brothers overcome their adversities during 13 months in order to achieve theirs.